Holy mother of books! This one is killer you guys. Marie Lu promised The Rose Society would be dark, and she wasn't kidding! I picked up the book and read the first half in one sitting. The only reason I didn't finish the whole book is because I had to go to work the next morning and it was getting really late. Stupid work, always getting in the way of my reading time! We pick up right where The Young Elites left off. Adelina feels she has been betrayed, so she and her sister set off in a search for new elites to join their fight against the Inquisition. Adelina's powers are mostly fed off of the pain and fear of others, so the reader sees first hand how Adelina's personality begins to change and darken. New characters are introduced, new struggles are faced, and Adelina begins to become a person she never imagined. Even though it was clear to see the darkness entering Adelina, I still loved her character and was constantly rooting for her. 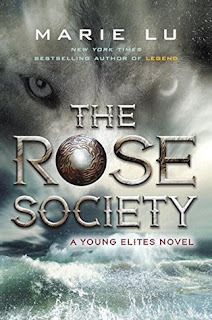 The Rose Society is a non-stop, action packed book filled with constant surprises. It is so different and darker than I had expected, but I loved it! I would definitely recommend this book to friends.